There are two Western Hemisphere Shorebird Reserve Network sites in the Great Basin shrub-steppe. Great Salt Lake, Utah (62), supports 400,000 acres of wetlands, which in turn supports five million migratory birds of 250 species. At current elevation the lake is 1,700 square miles in area, extending 75 miles by 28 miles. Islands in the lake, many mountainous, include Antelope Island State Park (see below under state and local sites), Stansbury, Fremont, Carrington, Gunnison, Dolphin, and Badger. Bird, Egg, and White Rock islands support rookeries. The Great Salt Lake Shorelands Preserve (63), latitude 41˚ 2’N, longitude 112˚ 2’W, of the Nature Conservancy and the Utah Reclamation Mitigation and Conservation Commission extends 11 miles between Farmington and the Antelope Island Causeway. There are four Important Bird Areas (IBAs) corresponding to different arms of the lake, which have different salinities and are different waterfowl and shorebird habitats. Farmington Bay is the southeastern part between Antelope Island and Salt Lake City. Ogden Bay is a northeastern area. The south arm is Gilbert Bay, and the north arm is Gunnison Bay. These are Important Bird Areas (IBAs) for American avocet, black-necked stilt, California gull, eared grebes, Wilson’s phalaropes and other waterfowl. The other Western Hemisphere Shorebird Reserve Network site is American Falls Reservoir/Springfield Bottoms, Bureau of Reclamation, Idaho (64), 42˚ 51’ N, 112˚ 50’ W. At 56,000 acres, this is one of the largest irrigation reservoirs, storing 1.7 million acre-feet of water as part of the Minidoka Project. A visitor center is at the dam, and a fish hatchery with nature trail along the Snake River (Idaho Department of Fish and Game) is below the dam. The reservoir is an IBA for the California gull and waterbirds. Fort Hall National Historic Landmark (described above) is at the upper end on the Snake River opposite McTucker Island. The Fort Hall (Springfield) Bottoms are a waterfowl feeding ground fed by up to 50 cool, clear springs. The Sterling Wildlife Management Area on the reservoir is 3,600 acres covering a seven-mile stretch of the northern shoreline. It contains 1,500 acres of wetlands and is itself an IBA for waterbirds and shorebirds. National Natural Landmarks in the Great Basin are the City of Rocks National Reserve, Idaho (65), 42˚4’N, 113˚ 43’ W, which was previously described under National Historic Landmarks, and Ruby Lake National Wildlife Refuge, Nevada (66), 40˚10’ N, 115˚ 29’ W. Over 200 springs at the base of the Ruby Mountains create Ruby Marsh, the largest and finest natural wetland in Nevada, protecting the greater sandhill crane and the trumpeter swan and hosting the largest nesting population of canvasback ducks west of the Mississippi River. National Forest (NF) System lands in the Great Basin shrub-steppe are mostly on the mountain peaks. Forests with areas in the Great Basin are Caribou NF, Humboldt NF, Sawtooth NF, and Wasatch NF. There is also the Curlew National Grassland administered by the Forest Service. The Great Basin portion of the Caribou NF consists of four units in southeastern Idaho administered by the Westside Ranger District. The area south of Pocatello in the Bannock Range (67), centered on 42˚44’ N, 112˚ 24’ W, is dominated by Scout Mountain and contains the Cherry Springs Nature Area, with trails along riparian meadows. The willow and dogwood thickets of Mink Creek and Cherry Springs are an IBA for sharp-tailed grouse, pinon jay, and juniper titmouse. The Crestline Trail crosses this area. In the Elkhorn Mountains (68), 42˚ 22’ N, 112˚19’W, west of I-15 and north of Malad City, is the Wright’s Creek National Recreation Trail (see below). In the Portneuf Range (69), 42˚ 48’ N, 112˚ 9’W) east of Pocatello is the Pebble Creek Ski Resort and a hiking area around Inkom Pass. On the Idaho-Utah state line east of I-15 are the Bannock Range with the Oxford Mountain area (70), 42˚ 16’ N, 112 ˚ 6’ W, which is a steep ridge covered with pine and fir and cut by scenic canyons, along with the Malad Range with Weston Canyon, Idaho (70), 42 ˚ 7’ N, 112 ˚ 6’ W, and Clarkston Mountain in Utah (41 ˚ 57’ N, 112 ˚ 8’ W). Curlew National Grassland, Idaho (71), 42 ˚ 5’ N, 112 ˚ 42’ W is administered as part of the Westside Ranger District of the Caribou NF and consists of three land areas to the north and south of Holbrook, Idaho. The grassland is noted as habitat for sage grouse and sharptailed grouse and is part of the Raft River/Curlew Valley IBA for greater sage grouse and Ferruginous hawk. Sweeten Pond provides a waterfowl area. The grassland is crossed by the Hudspeth cutoff of the California Trail, and a short section of the historic trail can be hiked. Humboldt NF, Nevada, is in northeastern Nevada. Three land areas of this forest are in the northern Great Basin shrub-steppe. The high peaks of these areas are in a separate ecoregion, Great Basin Montane, described previously. 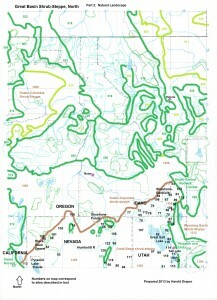 The Jarbridge and Mountain City Ranger Districts (72), centered on 41 ˚ 47’ N, 115 ˚ 39’ W, administer one contiguous unit north of Elko on the Idaho state line. This area rises 4,000 feet above the Snake River Plain to the north and contains numerous peaks over 10,000 feet in elevation. Vegetation ranges from sagebrush to alpine meadows and pine forests. The area is noted for sculptured rock formations and golden eagles. The Ruby Mountains Ranger District (73), centered on 40 ˚ 38’ N, 115 ˚ 26’ W, is located east and south of Elko. Known for spring wildflowers, this area contains glaciated Lamoille Canyon, the Yosemite of Nevada, and glacial lakes and cirques. Vegetation ranges from sagebrush to pine forests on rocky peaks. The Santa Rosa Ranger District (74), 41 ˚ 40’ N, 117 ˚ 33’ W, is located north of Winnemucca and is noted for the scenic drive between Paradise Valley and Hinkey Summit. The drive features unusual stone pillars and wildflowers at the summit. Four wilderness areas, East Humboldts, Jarbridge, Ruby Mountains, and Santa Rosa-Paradise Peak are within the map area. Albion Division, Idaho (75), 42˚ 18’ N, 113˚ 40’ W, is located between Burley, Idaho and the City of Rocks National Reserve. It is known for the Mount Harrison Research Natural Area and Botanical Special Interest Area. This high altitude mountain contains a lake in a glacial cirque. Lake Cleveland campground is on the glacial lake. The tall forb community between 6,300 and 11,000 feet in elevation provides a wildflower display in the summer of geranium, yarrow, lupine, and daisies. Rare plants include an Indian paintbrush. The 26-mile Skyline Trail connects Mount Harrison with 10,000-foot Cache Peak and City of Rocks. Black Pine Division, Idaho (76), 42 ˚ 7’ N, 113 ˚ 7’ W, includes the Black Pine Mountains and canyons, and is located to the west of I-84, north of Utah Route 42, and east of Idaho Route 81. This area is part of the Raft River/Curlew Valley IBA for greater sage grouse and ferruginous hawk. Cassia Division, Idaho (77), 42˚ 11’ N, 114˚ 17’ W, located southeast of Twin Falls, is called the South Hills and contains desert canyons. Rock Creek Canyon road winds through volcanic ash that is eroded into hoodoos and pinnacles. Prominent ridges are Hudson Ridge, Cottonwood Ridge, and Deadline Ridge. The area is part of the South Hills IBA for northern goshawk, sharp-tailed grouse, sage grouse, and the endemic South Hills crossbill. Raft River Division, Utah (78), 41˚ 54’ N, 113˚ 26’ W, includes the Raft River Mountains of northwestern Utah, which extend east-west just south of the Idaho state line and west of Utah Route 30. The Bally Mountains and Dove Creek Mountains are also included in the forest boundary. Sublette Division, Idaho (79), 42˚ 18’ N, 112˚ 56’ W, includes much of the Sublette Range and numerous deep canyons to the north of I-84 and west of Idaho Route 37. Two of the larger canyons are North Heglar Canyon and Flint Canyon. Summit Springs and Sublett Creek are sites on the Hudspeth Cutoff, California National Historic Trail. This area is part of the Raft River/Curlew Valley IBA for greater sage grouse and Ferruginous hawk. Wasatch NF, Utah, located mostly in the Wasatch and Uinta Mountains ecoregion, contains two land areas west of Salt Lake City in the Great Basin shrub-steppe ecoregion. One area (80) is centered on 40˚ 28’ N, 112˚ 38’ W, contains Deseret Peak Wilderness (see). The other area (81), located at coordinates 40˚ 0’ N, 112˚ 28’ W, includes part of the Sheeprock Mountains, West Tintic Mountains, and Red Pine Mountain. The National Landscape Conservation System in the Great Basin shrub-steppe consists of wilderness areas, which are described separately below, and the Black Rock Desert-High Rock Canyon Emigrant Trails National Conservation Area (BRDHRCET NCA), Nevada (82). Known mostly for the Burning Man Festival, held in the Black Rock Desert Playa, this immense area preserves the longest remnants of historic trails to California and Oregon. From Rye Patch Reservoir (see) on the east, the Applegate Trail extends west to Willow Springs, Antelope Pass, Kamma Pass, and Rabbithole Spring, where the Nobles Trail heads southwest. The Applegate Trail continues west to Black Rock Springs, Double Hot Springs, Lassen/Clapper Burial Site, and Fly Canyon Wagon Slide to High Rock Canyon. High Rock Canyon is an IBA for nesting raptors and swallows, while nearby High Rock Lake is known for nesting waterfowl and sage grouse. Other features are the Hanging Rock Petrified Forest and Soldier Meadows, located near High Rock Canyon. Soldier Meadows is a complex of hot springs harboring desert dace, four endemic springsnails, and basalt cinquefoil. Wilderness areas within or partly within the NCA are Black Rock Desert, Calico Mountains, East Fork High Rock Canyon, High Rock Canyon, High Rock Lake, Little High Rock Canyon, and Pahute Peak (see separate descriptions). National Park Systems lands in the northern Great Basin shrub-steppe are the City of Rocks National Preserve and Golden Spike National Historic Site. Both were previously described under cultural sites, although the City of Rocks is a National Natural Landmark also. Federal reservoirs which provide recreation in the Great Basin shrub-steppe are managed by the Bureau of Indian Affairs and Bureau of Reclamation. In addition, there are federally licensed hydroelectric reservoirs operated by others which are described in this section. These reservoirs are found in four freshwater ecoregions which overlap with the Great Basin shrub-steppe terrestrial ecoregion: Bonneville, Columbia Unglaciated, Lahontan, and Upper Snake. Bonneville and Lahontan are former glacial-era lake basins. The boundary between the Columbia Unglaciated and Upper Snake freshwater ecoregions is Shoshone Falls, Idaho. In the Upper Snake River ecoregion is the American Falls Reservoir, Bureau of Reclamation, Idaho, previously described under the Western Hemisphere Shorebird Reserve Network. Also in the Upper Snake River ecoregion on the Blackfoot River is Blackfoot Reservoir, Bureau of Indian Affairs (BIA), Idaho (83), 42˚ 54’ N, 111˚ 36’ W, an 18,600-acre reservoir providing irrigation for the Fort Hall Indian Reservation of the Shoshone-Bannock tribes to the west. The reservoir’s Gull Island is an IBA for American white pelican and California gull. Islands provide nesting for pelicans, cormorants, and gulls. Waterfowl also use the reservoir. The Blackfoot River canyon downstream on BLM lands is habitat for the golden eagle, falcons, and great horned owls. Ririe Reservoir, Bureau of Reclamation, Idaho (84), 43˚ 34’ N, 111˚ 44’ W, is also in the Upper Snake freshwater ecoregion. The Ririe Project, 15 miles northeast of Idaho Falls, provides flood control and irrigation as well as reservoir recreation. The reservoir is in a canyon carved by Willow Creek. Mitigation for the project led to the purchase of the Tex Creek Wildlife Management Area (WMA), 29,000 acres of bitterbrush shrub-steppe big game habitat in the southern and southeastern part of the reservoir, and Cartier Slough WMA, a waterfowl area on Henry’s Fork west of Rexburg. Tex Creek WMA (43˚ 26’ N, 111˚ 39’ W) is an area of deep canyons and is an IBA for the sharp-tailed grouse and greater sage grouse. It is located on the upper end of Ririe Reservoir, along Grays Lake outlet, and along Tex Creek between Ririe Reservoir and Caribou National Forest. Wild Horse Reservoir, Bureau of Indian Affairs and Shoshone-Paiute Tribes, Nevada (85), 41˚ 41’ N, 115˚ 51’ W, is an irrigation reservoir on the Owyhee River within the Columbia Unglaciated freshwater ecoregion constructed by the BIA. Recreation is managed by the Bureau of Land Management and Wild Horse State Recreation Area. In the Bonneville freshwater ecoregion is Hyrum Reservoir, Bureau of Reclamation, Utah (86), 41˚ 47’ N, 111˚ 52’ W, located between Logan and Brigham City. This dam on the Little Bear River stores water for irrigation in the Cache Valley. Recreation is managed as Hyrum State Park. Newton Reservoir, Bureau of Reclamation, Utah (87), 41˚ 54’ N, 111˚ 59’ W, impounds Clarkston Creek near the Idaho State Line and also stores water for irrigation in the Cache Valley. Also near Newton is the federally licensed Cutler Reservoir, operated by Rocky Mountain Power (Pacificorp), Utah (88), on the Bear River at 41˚ 50’ N 112˚0’ W. Lowland riparian areas serve as an alternate habitat when the Great Salt Lake experiences high water. It is an IBA for white-faced ibis, American avocet, and American white pelican. Some Cutler reservoir areas are managed by the state as Bud Phelps Wildlife Management area and by the Bridgerland Audubon Society. Upstream on the Bear River in Idaho are three privately managed hydroelectric reservoirs. Soda Springs Reservoir (often mapped as Alexander Reservoir), (89), 42˚ 39’ N, 111˚ 40’ W, federally licensed and managed by Rocky Mountain Power (Pacificorp), provides reservoir recreation opportunities along U.S. Route 30 just west of Soda Springs. Grace Dam (90), 42˚ 35’N, 111˚ 44’ W, on Route 34, also provides whitewater recreation downstream in the Black Canyon of the Bear River. Water is diverted to the canyon mouth in the Gentile Valley, where power facilities are located. Oneida Reservoir (42-17 N, 111-45 W), the lowermost hydroelectric dam on the Bear River in Idaho managed by Rocky Mountain Power, is north of Preston, Idaho in the Oneida Narrows canyon off of Route 36 and also provides reservoir recreation. Arthur V. Watkins Dam and Willard Bay Reservoir, Bureau of Reclamation, Utah(92), 41˚ 22’ N, 112˚ 6’ W, impounds the Weber River arm of Great Salt Lake, storing water as part of the Weber Basin Project. Recreation is managed as Willard Bay State Park (see). In the Lahontan freshwater ecoregion on the Humboldt River is Rye Patch Reservoir, Bureau of Reclamation, Nevada (93), 40˚ 31’ N, 118˚ 19’ W. Located 22 miles upstream from Lovelock, this 11,000-acre reservoir provides irrigation storage before the Humboldt River evaporates in the desert just downstream. The National Trail System in the Great Basin consists of two National Recreation Trails (NRTs) in addition to the California, Oregon, and Pony Express National Historic Trails described earlier. Wetland Wonders NRT, Bear River Migratory Bird Refuge, Utah (92), 41˚ 30’ N, 112˚ 4’ W, is a one-half mile paved accessible trail adjacent to the Wildlife Education Center in Brigham City. Wright’s Creek National Recreation Trail, Caribou NF, Idaho (68), 42˚ 20’ N, 112˚ 19’ W, runs for 12 miles through a roadless area in the Elkhorn Mountains west of I-15. From Summit Campground in the southeast, the trail climbs Elkhorn Peak (9,000 feet) and ends in west-draining Reed Canyon. There are 12 federally-designated Wilderness Areas in the Great Basin shrub-steppe. Becky Peak Wilderness, BLM, Nevada (94), 40.0˚ N, 114.6˚ W, consists of desert brush, grass, pinyon-juniper, and bristlecone pine in the Schell Creek Range, located to the east of US 93 and Lages Station. Features are Becky Peak and a number of spring-fed canyons. Black Rock Desert Wilderness, BLM, Nevada (95), 41˚ 15’ N, 118˚ 43’ W is located mostly north of the BRDHRCET NCA. This 314,800-acre wilderness includes the eastern arm of the dry lakebed of Lake Lahontan. The ancient lake shoreline has been the site of paleontological discoveries including remains of a wooly mammoth and sabre toothed tiger. It is mostly flat except for Elephant and Pinto Mountains. In wet years, the Quinn River flows through the wilderness and evaporates in the salt flats. Calico Mountains Wilderness, BRDHRCET NCA, Nevada (96), 41˚ 4’ N, 119˚ 14’ W, is a 65,000-acre sagebrush-covered wilderness is the southern portion of the Calico Mountains, including Division Peak, South Donnelly Peak, Morman Dan Peak, Copper Canyon, and Petrified Canyon. Cedar Mountain Wilderness, BLM Salt Lake Field Office, Utah (97), 40.6˚ N, 112.9˚ W, is a 99,400-acre wilderness including the 30-mile long Cedar Mountains, sagebrush-grassland, juniper woodlands, and limestone outcrop. Hastings Pass is a site along the Hastings Cutoff of the California Trail. The route was pioneered by Kit Carson and used by the Donner Party and other trail travelers. Deseret Peak Wilderness, Wasatch NF, Utah (80), 40.5˚ N, 112.6˚ W, is noted for steep canyons and rocky peaks in a juniper- and sagebrush-covered landscape. Highest elevations have patches of fir and aspen. There are 14 miles of trails. Geographic features include the Stansbury Mountains, Indian Hickman Canyon, Antelope Canyon, and South Willow Canyon. Goshute Canyon Wilderness, BLM, Nevada (98), 40.1˚ N, 114.9˚ W, is found in the Cherry Creek Range and includes massive white limestone cliffs, pinyon juniper, and bristlecone pine with aspens and cottonwood in drainages. Features are Log Canyon, Currie Summit, and Goshute Cave and Canyon. The location is west of US 93 at Lages Station, Nevada. East Humboldts Wilderness, Humboldt NF, Nevada (99), 40.9˚ N, 115.1˚ W, is dominated by the 11,000-foot peaks Hole in the Mountain and Humboldt Peak. This wilderness features six named lakes—Birdeye, Boulder, Greys, Smith, Steele, and Winchell. Vegetation ranges from grasses and sagebrush to mountain mahogany, limber pine, and aspen. Substantial geographical features are Boulder Creek, Lizzie’s Chimney Rock, Greys Creek, and Trout Creek. It is located between I-80, US 93, and State Route 229. High Rock Lake Wilderness, BRDHRCET NCA, Nevada (100), 41˚ 13’ N, 119˚ 14’ W, includes the generally dry High Rock Lake and Applegate Trail, along with the sagebrush-covered northern Calico Mountains. A rock slide 14,000 years before present filled Box Canyon and formed the lake, which now drains through Fly Canyon to the north. Fly Canyon is noted for its potholes or scour holes. North Jackson Mountains Wilderness, Nevada (101), 41˚ 21’ N, 118˚ 28’ W, includes Parrot Peak and Deer Creek Peak within its 23,400-acre boundary, and is vegetated with sagebrush and junipers. 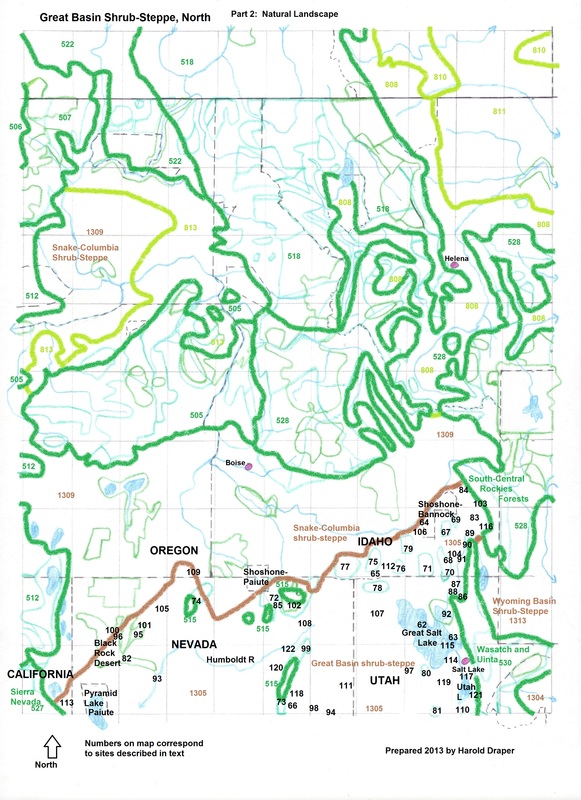 South Jackson Mountains Wilderness, Nevada (95), 41˚12’ N, 118˚ 33’ W, includes King Lear Peak, Navajo Peak, Hobo Canyon, Bliss Canyon, and McGill Canyon within its 54,500-acre sagebrush-covered area. Jarbridge Wilderness, Humboldt NF, Nevada (102), 41.8˚ N 115.4˚ W, contains eight peaks over 10,000 feet which rise 4,000 feet from surrounding valleys in this 111,000-acre wilderness. The area receives seven to eight feet of snow annually. There are 125 miles of trails. Substantial portions of the Marys River, Willow Creek, Jarbridge River, Camp Creek, Cottonwood Creek, and Canyon Creek are in the Great Basin shrub-steppe ecoregion. The area is an IBA for montane birds such as blue grouse, red crossbill, and Cassin’s finch. Pahute Peak Wilderness, BRDHRCET NCA, Nevada (96), 41˚ 16’ N, 119˚ 1’ W, is a 56,900-acre area which includes the central Black Rock Range. Features include Pahute Peak, Little Big Mountain, Indian Creek, and badlands. Vegetation is aspen, mountain mahogany, white bark pine on the north face of the peak; otherwise it is sagebrush. There are three National Wildlife Refuge (NWR) system areas in the northern Great Basin shrub-steppe. Bear River Migratory Bird Refuge, Utah (92), 41˚ 31’ N, 112˚ 22’W, is located two miles west of Brigham City on the Great Salt Lake. The refuge contains wet meadows and mud flats. Priority species are cinnamon teal, white-faced ibis, and Franklin’s gull. The refuge contains the largest colony of white-faced ibis in North America and is an IBA. Grays Lake NWR, Idaho (103), 43˚ 4’ N, 111˚ 26’ W, is the largest hardstem bulrush marsh in the world, set aside as a nesting and feeding area for waterfowl and is an IBA. Ducks include mallard, teal, canvasback, lesser scaup, and redhead. It is noted for nesting trumpeter swans and the largest nesting population of sandhill cranes in the world (200 nesting pairs). It was also the home of a short-lived effort to establish an alternative whooping crane flock, now discontinued. Water levels are controlled by the water rights of the Fort Hall Indian Reservation; the Grays Lake Outlet drains to Ririe Reservoir (see). Oxford Slough Waterfowl Production Area, Idaho (104), 42˚ 15’ N, 112˚ 0’ W, is located south of Swan Lake off U.S. Route 91 and is an IBA of marshes and meadows, providing a nesting area for redhead ducks, white-faced ibis, Franklin’s gull, trumpeter swan, and common loon. Other notable federal sites in the Great Basin shrub-steppe are listed below. Bilk Creek Mountains and Montana Mountains, BLM, Nevada (105), 41˚ 46’ N, 118˚ 12’W, are two north-south mountain ranges on either side of Kings River Valley. The area is an IBA because of a high density of sage grouse. Bowen Canyon Bald Eagle Sanctuary, BLM, Idaho (106), 42.6˚ N, 112.8˚ W, is an IBA providing roosting habitat for eagles using American Falls Reservoir ten miles away. Devil’s Playground, BLM, Utah (107), 41˚ 31’ N, 113˚ 40’W, is an area of granite rock weathered into bizarre shapes, including tunnels and arches, accessible off Emigrant Pass Road off Route 30 in the Bovine Mountains. Mary’s River, BLM, Nevada (108), centered on 41˚ 24’ N, 115˚ 14’ W, is a 50-mile-long riparian area extending north from I-80 at exit 333. The river serves as a bird migration corridor and is an IBA for Lewis’s woodpecker, red-naped sapsucker, and Bullock’s oriole. Twomile Creek on Battle Mountain, BLM, Oregon (109), 42˚ 05’ N, 117˚ 38’ W, is located to the northwest of the Fort McDermitt Indian Reservation and east of US Route 95. It is a glacial cirque with mountain mohagany, designated an IBA for black-throated gray warbler, blue-gray gnatcatcher, and Nashville warbler. Goshute Mountains, BLM, Nevada (111), 40˚ 24’ N, 114˚ 13’ W, funnel up to 20,000 raptors through passes in the fall migration; a good viewing point is from Alternate U.S. Route 93, 25 miles south of Wendover, Utah. Hawkwatch International staffs a viewing area on the ridgetop, accessible via a 2.5-mile, 1,800-foot climb on a trail. The area is an IBA. Maple Grove Hot Springs, BLM, Idaho (91), 42˚ 20’ N, 111˚ 43’ W, is located north of Oneida Reservoir on the Bear River off of State Route 34 north of Preston; the spring water is 172˚ F.
Raft River Valley, BLM, Idaho (112), 42˚ 10’ N, 113˚ 20’ W, extends from the City of Rocks downstream to I-84; this area between the Black Pine Mountains and the Jim Sage Mountains is an IBA for ferruginous hawks. Sierra Army Depot, California (113), 40˚ 12’ N, 120˚ 15’ W, is on Honey Lake, a transition area between the Great Basin and Sierra Nevada. It supports shorebirds, gulls, terns, burrowing owl, and sage grouse and is an IBA. South Shore Ecological Preserve, Utah Reclamation Mitigation and Conservation Commission, Utah (114), 40˚ 48’ N, 112˚ 7’ W, is an undisturbed remnant of the Jordan River delta on Great Salt Lake and is a joint project of the commission and the National Audubon Society. Antelope Island State Park, Utah (115), 40˚ 57’ N, 112˚ 13’ W, is a 28,000-acre mountainous island located in Great Salt Lake. There is a hiking trail network and a herd of bison. Access is from a causeway leading west from Exit 332 on I-15. Blackfoot River Wildlife Management Area, Idaho (116), 42˚ 50’ N, 111˚ 20’ W, is located in the Rasmussen Valley upstream from Blackfoot Reservoir and provides waterfowl and big game habitat. Castle Rocks State Park, Idaho (65), 42.1˚ N, 113.7˚ W, is northeast of City of Rocks National Reserve, and includes a pinyon pine forest, pictographs, wetlands, and rock formations. Doyle Wildlife Area, California (113), 40˚ 6’ N, 120˚ 6’ W, is a 10,000-acre management area located on Long Valley Creek adjacent to US Route 395 south of Sierra Army Depot. Flight Park State Recreation Area, Utah (117), 40˚ 26’ N, 111˚ 53’ W, is a unique park on I-15 north of Lehi, used as a training site for paragliding and hang gliding. Franklin Lake Wildlife Management Area, Nevada (118), 40˚ 21’ N, 115˚ 24’ W, is five miles north of Ruby Lake NWR; this area of wetlands is an IBA for waterbirds, terns, sage grouse, and sage sparrow. Hyrum State Park, Utah (86) is a reservoir recreation area located on the Bureau of Reclamation’s Hyrum Reservoir (see). Portneuf Wildlife Management Area, Idaho (69), 42˚ 43’ N, 112˚ 10’ W, is 16 miles southeast of Pocatello on I-15 and provides habitat for golden eagles. Rye Patch State Recreation Area, Nevada (93), 40˚ 31’N, 118˚ 19’ W, is a reservoir recreation area that includes both the federal Rye Patch Reservoir (see) and the smaller Pitt-Taylor Reservoirs. South Fork State Recreation Area, Nevada (120), 40˚ 41’ N, 115˚ 46’ W, is seven miles south of Elko on the former property of the Tomera Ranch dating from 1867. This reservoir was constructed on the South Fork Humboldt River by the Nevada Department of Conservation and Natural Resources. Tex Creek Wildlife Management Area, Idaho (84), 43˚ 26’ N, 111˚ 39’W. See Ririe Reservoir under federal recreation lake descriptions. Utah Lake State Park, Utah (121), 40˚ 11’ N, 111˚ 43’ W. This lake recreation area is located where the Provo River enters Utah Lake, a large freshwater lake first described by the Dominguez-Escalante expedition in 1776. Provo Bay has emergent vegetation and is an IBA for shorebirds and waterfowl. Wild Horse State Recreation Area, Nevada (85), 41˚ 41’ N, 115˚ 51’ W. This reservoir recreation area is located on the Bureau of Indian Affair’s Wild Horse Reservoir (see listing under federal recreation lake descriptions). Willard Bay State Park, Utah (92), 41˚ 22’ N, 112˚ 6’W. This is a reservoir recreation area created by the Bureau of Reclamation’s Arthur V. Watkins Dam (see listing under federal recreation lake descriptions). It is a wildlife watching area for nesting eagles. Boyd Ranch, Nevada (122), 40˚ 55’ N, 115˚ 28’ W. A rich riparian wetland along the Humboldt River, Lamoille Creek, and Rabbit Creek near Elko is under conservation easement of the American Land Conservancy and provides hay meadows used by egrets and black-crowned night herons and is an IBA. The area is privately owned. Formation Springs Preserve, The Nature Conservancy, Idaho (89), 42˚ 42’ N, 111˚ 33’ W. On Route 34 north of Soda Springs is an area of terraced mineral pools used by waterfowl along with cave features. Niter Ice Cave, Grace, Idaho (90), 42 ˚ 32’ N, 111 ˚ 44’W. This walk-in lava tube is located three miles south of Grace on Route 34. Stockton Bar, Utah (119), 40˚ 28’ N, 112˚ 22’ W, is a well-preserved sandbar remnant of the Lake Bonneville shoreline that can be seen off of Route 36 between Tooele and Stockton. The following freshwater ecoregions overlap with the north portion of the Great Basin shrub steppe and are useful in describing the subregions of the Great Basin. The freshwater ecoregions are based on drainage areas and aquatic biodiversity. Bonneville, found in Idaho, Nevada, Utah, and Wyoming, includes the drainages of the former Bonneville Lake. The Bear River and Bear Lake, Utah Lake, and Great Salt Lake all support endemic fish. The Pequop Mountains of northeastern Nevada are the western boundary. Lahontan, which is found in California, Nevada, and Oregon, includes the drainage areas of the former ice age lake. Water bodies include Humboldt River, Eagle Lake (California), and Pyramid Lake in the map area. There are three endemic fish genera, and the endemic cui-ui fish in Pyramid Lake. Columbia Unglaciated, which is found in parts of Idaho, Nevada, Oregon, and Washington, includes the Columbia River from the Dalles Dam to the Snake confluence, the Snake River upstream to Shoshone Falls, the Deschutes River, John Day River, Owyhee River, Bruneau River, Boise River, Salmon River, Clearwater River, and Palouse River. The endemic fish genus Oregonichthys is found in the ecoregion. Upper Snake, which is found in Idaho, Utah, and Wyoming, begins at Shoshone Falls near Twin Falls, Idaho. The falls are a barrier to fish movement. Only 35 percent of the fish above Shoshone Falls are shared with the lower Snake. There is also high freshwater mollusk endemism. Boffey, Philip M. 1968. Nerve Gas: Dugway Accident Linked to Utah Sheep Kill. Science 162:1460-1464. Grebenkemper, John, Kristin Johnson, and Adela Morris. 2012. Locating the Grave of John Snyder. Overland Journal (Quarterly Journal of the Oregon-California Trails Association) 30(3):92-108 (Fall 2012). Rhode, David, Ted Goebbel, Kelly E. Graf, Bryan S. Hockett, Kevin T. Jones, David B. Madsen, Charles G. Oviatt, and Dave N. Schmitt. 2005. Late Pleistocene-Early Holocene Human Occupation and Change in the Bonneville Basin, Utah-Nevada. Pages 211-230 In Joel L. Pedersen and Carol Merritt Dehler, eds. Interior Western United States: Geological Society of America Field Guide 6. US Department of the Interior, National Park Service, 2010. Utah—Crossroads of the West. National Historic Trails Auto Tour Interpretive Guide. NPS Intermountain Region.